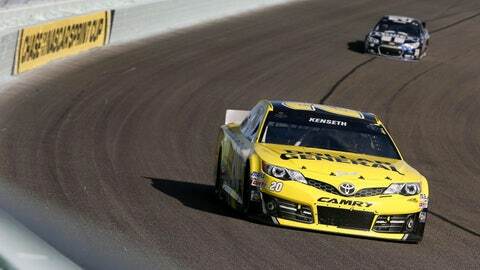 Matt Kenseth (20) leads Jimmie Johnson in the 2013 season finale at Homestead-Miami Speedway. Matt Kenseth had a sensational first season with Joe Gibbs Racing in 2013, winning a career-high and series-high seven NASCAR Sprint Cup Series races and finishing a close second to Jimmie Johnson in the championship. Kenseth’s primary sponsor, Dollar General, is rewarding that performance by increasing its sponsorship of Kenseth’s No. 20 JGR Toyota from 17 to 27 races next season. "Dollar General is excited to build on its successful partnership with Joe Gibbs Racing and sponsor more races with Matt Kenseth and the No. 20 team next year," said Rick Dreiling, Dollar General’s chairman and chief executive officer, in a statement issued by JGR on Monday morning. "NASCAR is key to connecting with our customers, many of whom are loyal race fans, and we look forward to a continued partnership with JGR to further our business." "Having the talent and passion in a driver like Matt and the way he represents our brand is a dream come true for a sponsor," Dreiling said. "The excitement and professionalism that Matt brings to the sport is exceptional and one of this year’s highlights for me has been watching him celebrate in Victory Lane seven times. On behalf of the Dollar General team, let’s go racing in 2014!" Dollar General will again sponsor Kenseth in the season-opening Daytona 500, a race he has already won twice. Dollar General will also be the primary sponsor on Kenseth’s car at the season finale at Homestead-Miami Speedway, the May Talladega Superspeedway race, the Brickyard 400 at Indianapolis Motor Speedway, the last race of the Sprint Cup regular season at Richmond International Speedway, the first Chase for the Sprint Cup race at Chicagoland Speedway and the October event at Charlotte Motor Speedway.